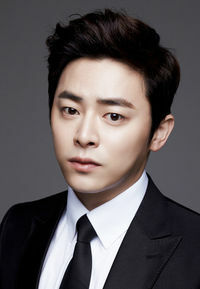 Jo Jung-suk had always wanted to be on stage. He was admitted into the Theater department of Seoul Institute of the Arts on student loan, but after his father died in 2000, Jo's widowed mother became fully dependent on him. He was granted an exemption from military service due to family circumstances, and he quit school before graduating so he could start earning money by doing musicals. He debuted in The Nutcracker in 2004. Jo has since become active and well-known in musical theatre, acting in a total of 25 musicals during the first nine years of his career, including Organ in My Heart (musical adaptation of The Harmonium in My Memory), Janggeum the Great (musical adaptation of Jewel in the Palace), and Korean productions of Hedwig and the Angry Inch, Grease, The Island, and Spring Awakening. In 2011 he landed his first television role on cable series What's Up as awkward but talented music student Kim Byung-gun. But 2012 would be his breakout year, starring in two high-profile projects. He played a supporting role in box office hit Architecture 101 as the young hero's best friend Nab-ddeuk, bursting with personality and comic timing. And he was once again a scene stealer in his third onscreen role as earnest soldier Eun Shi-kyung in the network drama The King 2 Hearts. Jo's display of versatility and screen presence in those projects has caused a recent surge in mainstream popularity for the actor, resulting in close to twenty offers for films and dramas, not to mention commercials. This page was last edited on 5 April 2019, at 07:22.